Driving under the influence driving while impaired driving with excessive alcoholic content definitions penalties. Download "42 4 1301. Driving under the influence driving while impaired driving with excessive alcoholic content definitions penalties." 2 a defendant presents some credible evidence, that the defendant consumed alcohol between the time that the defendant stopped driving and the time that testing occurred, such issue shall be an affirmative defense, and the prosecution must establish beyond a reasonable doubt that the minimum 0.08 blood or breath alcohol content required in this paragraph (a) was reached as a result of alcohol consumed by the defendant before the defendant stopped driving. 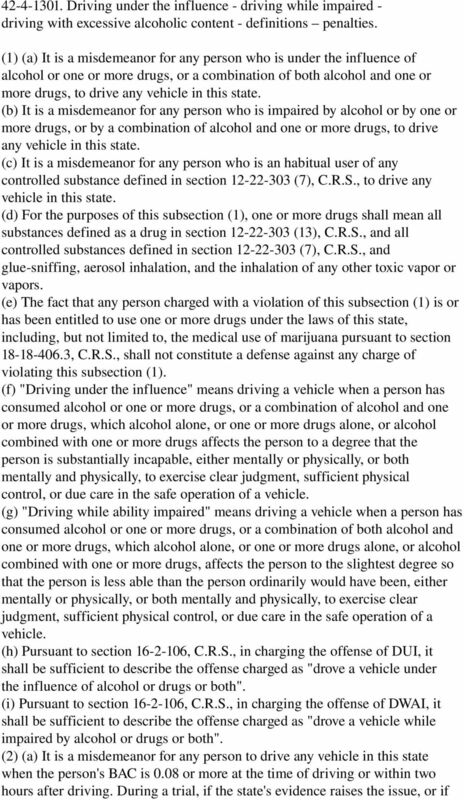 (a.5) (I) It is a class A traffic infraction for any person under twenty one years of age to drive any vehicle in this state when the person's BAC, as shown by analysis of the person's breath, is at least 0.02 but not more than 0.05 at the time of driving or within two hours after driving. The court, upon sentencing a defendant pursuant to this subparagraph (I), may, in addition to any penalty imposed under a class A traffic infraction, order that the defendant perform up to twenty four hours of useful public service, subject to the conditions and restrictions of section , C.R.S., and may further order that the defendant submit to and complete an alcohol evaluation or assessment, an alcohol education program, or an alcohol treatment program at such defendant's own expense. (II) A second or subsequent violation of this paragraph (a.5) shall be a class 2 traffic misdemeanor. 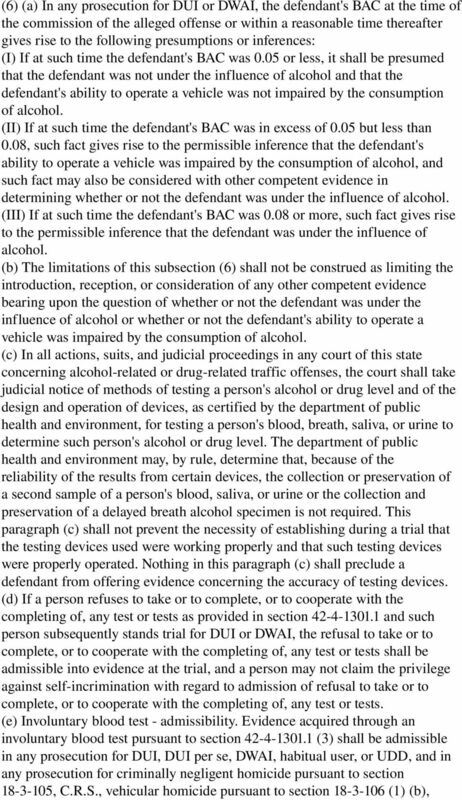 (b) In any prosecution for the offense of DUI per se, the defendant shall be entitled to offer direct and circumstantial evidence to show that there is a disparity between what the tests show and other facts so that the trier of fact could infer that the tests were in some way defective or inaccurate. Such evidence may include testimony of nonexpert witnesses relating to the absence of any or all of the common symptoms or signs of intoxication for the purpose of impeachment of the accuracy of the analysis of the person's blood or breath. 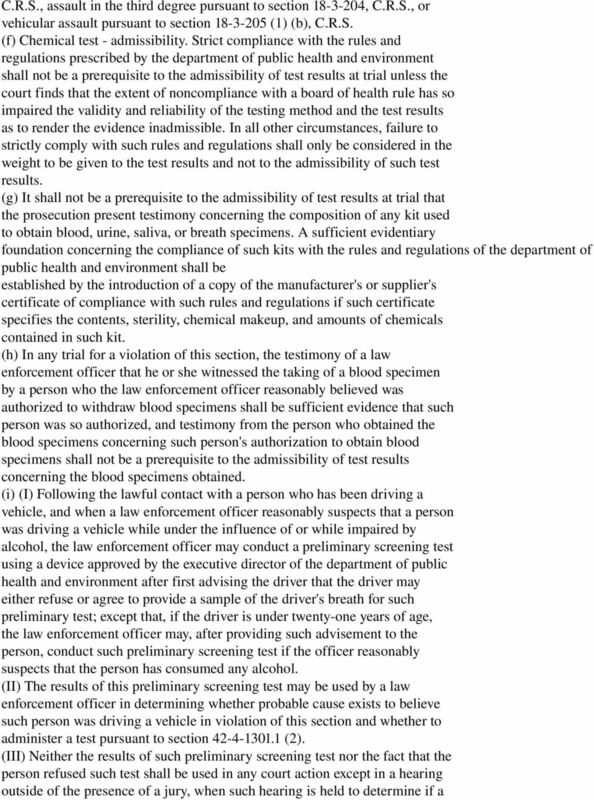 (c) Pursuant to section , C.R.S., in charging the offense of DUI per se, it shall be sufficient to describe the offense charged as "drove a vehicle with excessive alcohol content". (3) The offenses described in subsections (1) and (2) of this section are strict liability offenses. 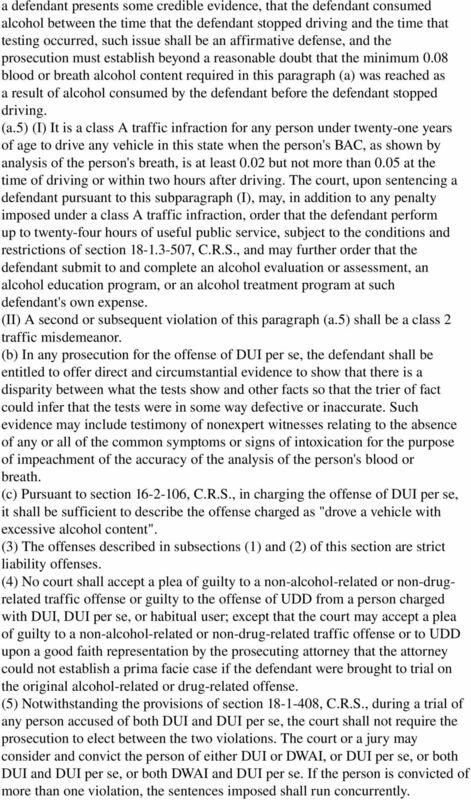 (4) No court shall accept a plea of guilty to a non alcohol related or non drugrelated traffic offense or guilty to the offense of UDD from a person charged with DUI, DUI per se, or habitual user; except that the court may accept a plea of guilty to a non alcohol related or non drug related traffic offense or to UDD upon a good faith representation by the prosecuting attorney that the attorney could not establish a prima facie case if the defendant were brought to trial on the original alcohol related or drug related offense. (5) Notwithstanding the provisions of section , C.R.S., during a trial of any person accused of both DUI and DUI per se, the court shall not require the prosecution to elect between the two violations. The court or a jury may consider and convict the person of either DUI or DWAI, or DUI per se, or both DUI and DUI per se, or both DWAI and DUI per se. If the person is convicted of more than one violation, the sentences imposed shall run concurrently. 8 for purposes of treatment not to exceed two years; in addition, a court may also sentence a defendant who is twice or more convicted pursuant to this section to a period of probation not to exceed two additional years for the purpose of monitoring compliance with court orders. As a condition of probation, the defendant shall be required to make restitution in accordance with the provisions of section , C.R.S. 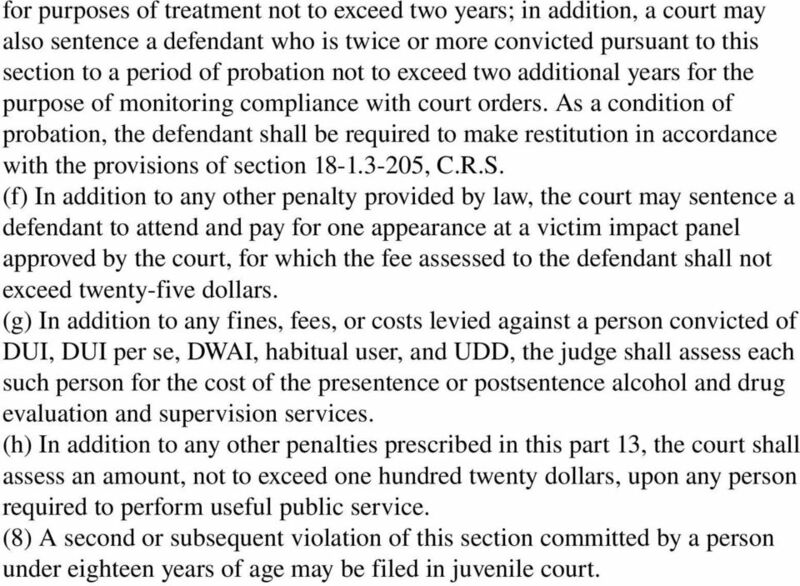 (f) In addition to any other penalty provided by law, the court may sentence a defendant to attend and pay for one appearance at a victim impact panel approved by the court, for which the fee assessed to the defendant shall not exceed twenty five dollars. (g) In addition to any fines, fees, or costs levied against a person convicted of DUI, DUI per se, DWAI, habitual user, and UDD, the judge shall assess each such person for the cost of the presentence or postsentence alcohol and drug evaluation and supervision services. (h) In addition to any other penalties prescribed in this part 13, the court shall assess an amount, not to exceed one hundred twenty dollars, upon any person required to perform useful public service. (8) A second or subsequent violation of this section committed by a person under eighteen years of age may be filed in juvenile court.